Former USD head coach Lamont Smith. Courtesy of WCC Sports. The University of San Diego confirmed Wednesday that former head men’s basketball coach Lamont Smith and two others connected to the school were implicated in what authorities have described as the largest college admissions cheating scandal. Smith left the university under fire in March 2018 after he was arrested on suspicion of domestic violence. 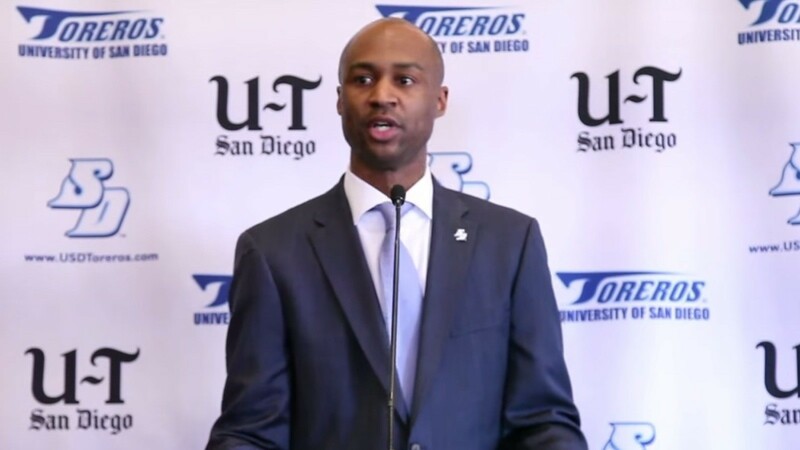 The case was subsequently dropped, and Smith left USD to join the University of Texas-El Paso men’s basketball team as an assistant coach. The scheme, which began in 2011, centered on a Newport Beach college placement firm run by William “Rick” Singer, who has pleaded guilty to federal charges. The Justice Department investigation revealed a network of wealthy parents who funneled millions of dollars to Singer, who promised them that he could get their children into elite colleges and universities, including UCLA, USC, Stanford, Yale and Georgetown, by bribing test proctors and athletic coaches and fudging test scores.